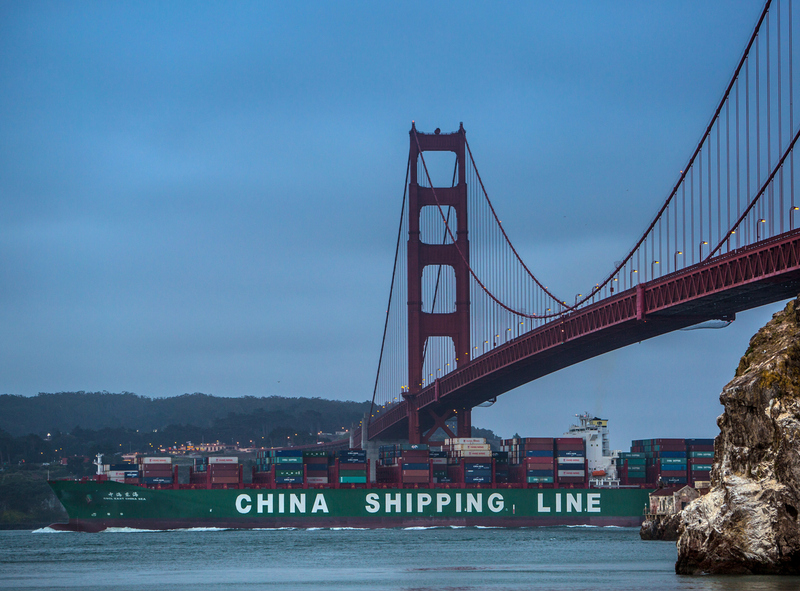 A vessel carrying containers named CSCL East China Sea operated by COSCO Shipping Development Co., Ltd passes under the Golden Gate Bridge before sunrise in San Francisco, June 23, 2015. In the midst of roiling trade tensions between the United States and China, last week Treasury Secretary Steve Mnuchin led a delegation of Donald Trump’s top economic advisors to Beijing. Demands were made in both directions and talks were inconclusive. Beijing said “relatively big” differences remain. Unmet were the Trump administration’s requests of a reduction of up to U.S.$200 billion in the United States’ trade deficit with China of U.S.$375 billion, and for China to lower tariffs on U.S. products to levels the U.S. imposes on Chinese products. The U.S. threatens U.S.$50 billion in tariffs on Chinese goods, focusing on technology products benefiting from Beijing’s “Made in China 2025” program promoting advanced technologies such as semiconductors, artificial intelligence, and electric cars. A booby-trapped ball of cotton candy—sweet floss on the outside masking a sharp needle inside—is an appropriate analogy for the Trump White House’s offer of trade negotiations. The sweetener is the flexible timelines and possibility of extension for implementation of the threatened tariff. The needles, of course, are the tariffs, which can be reduced or inflated depending on the response to demands for concessions. It’s not China’s choice to make, nor any other U.S. trading partner. Rather, it is the Trump White House that is choosing to play hardball in trade negotiations. China is in a queer situation whereby many in and outside the United States disagree with the tactics Trump has been using against Beijing, but there has emerged no public sympathy, much less any offer of a united front, in Beijing’s favor. There is little agreement about a key cause of the dispute: it is the global chain of production, on top of outdated “country of origin” rules around assembled final products, that are responsible for the large trade surplus China has with the U.S. Assuming that China accepted without questioning the numerical targets in reduction of trade flow into the U.S., the only way for the government of China to actually deliver on that promise would have to be cutting off those multinational corporations investing in production and trade with China. It is the companies (mostly multinational ones, with a small but growing list of China-owned firms) that have taken advantage in factors of production such as wage differences and costs to environmental protection. Why, then, has there emerged no public sympathy for China? A good part of the explanation comes from the fact that industry associations representing American and European investors in China—precisely the same ones that benefit from fiscal stimulus and industry subsidies—have joined the chorus to demand a more level playing field. Many of the foreign corporations’ complaints and suggestions are legitimate and should serve as important reference for reform. China has thrived on having competition in its domestic markets, however limited and unsatisfactory, and will need to work harder to entice foreign businesses to stay in the age of ever-increasing international competition. China will be wise to negotiate seriously within its own government departments to set foreign and domestic companies into competition side by side. As for the negotiation processes between the trade departments of the two countries, we are just seeing the beginning of the game. Given the precedent of U.S.-Japan trade negotiations from the 1980s to the 1990s, it is going to be a long period of back-and-forth. Quite likely, these (re)negotiations won’t end until the bulk of the international production that sends products to the United States moves away from China, as was true of the case with Japan in the late 1990s. As we previously stated in our Moody’s April 11 sector in-depth on this topic, we expect the tariffs implemented so far by the U.S. administration to have a direct but contained effect on China’s economy. However, the primary economic impact will not come directly from the targeted sectors, but will instead be the result of the indirect effect of tariffs on a wider range of Chinese manufacturers and exporters through domestic value chains. Our baseline expectation is that the U.S. and China will avoid a severe escalation of trade restrictions, given the detrimental impact that additional restrictions would have on both economies. Nevertheless, if the proposed tariffs are implemented, they would signal a serious deterioration in U.S.-China trade relations. In such a scenario, as the world’s two largest economies, we would expect a material macroeconomic impact in which reciprocal tariffs raise import prices and reduce household real incomes, lower trade flows, increase risk aversion, and weaken wealth effects because of lower asset prices. Any retaliatory measures by China or other trading partners or additional protectionist steps by the U.S. would have more widespread negative credit implications for sovereigns globally because the measures will erode the global, rules-based trading system. Further, the impact of rising uncertainty and political risk are likely to be felt through their impact on business investment and investor sentiment in financial markets.